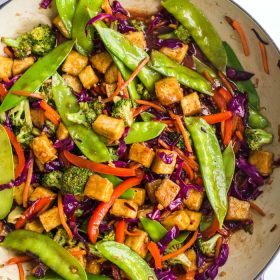 This Veggie & Tofu Stir Fry is an easy vegan dinner that’s quick, healthy, and SO DELICIOUS! Great for weeknight dinners and the crispy tofu is amazing! Make your crispy baked tofu. In a large skillet, heat the sesame oil over medium heat. Once hot, add in the snow peas, carrot, bell pepper, cabbage, and broccoli. Cook until crisp tender, about 7 minutes. Continue to stir frequently. While the veggies are cooking, make your sauce by whisking together the oil, rice vinegar, soy sauce, broth, sriracha, maple syrup, and cornstarch. Once the veggies are crisp tender, toss in the baked tofu and the stir fry sauce. Continue to cook for 5 additional minutes until the sauce has thickened quite a bit and until the veggies are tender. Serve with rice or quinoa (or whatever else floats your boat) and ENJOY!! **If you’re short on time and just want to make this whole meal even easier, you can use a 10oz (ish) bag of frozen stir fry vegetables. This can also be a farily big money saver as opposed to buying a bunch of fresh vegetables.